Friction is the tangential resistance to motion. The occurrence of friction is a part of everyday life. It is needed so that we have control on our walking. On the other hand, in most of running machines friction is undesirable (energy loss, leading to wear of vital parts, deteriorating performance due to heat generation) and all sorts of attempts (i.e. using low friction materials, lubricating surfaces with oil or greases, changing design so that sliding can be reduced) have been made to reduce it. Often coefficient of friction(μ) is considered a constant value for a pair of material. In addition, the value of μ is accounted much lesser than 1.0. Friction is NOT a Material Property .Friction is a “System” Property. When two objects touches each other- there will produce friction forces between them. To understand the effect of material pair, role of lubrication, and environmental factors let us start with dry friction. The dry friction is also known as solid body friction and it means that there is no coherent liquid or gas lubricant film between the two solid body surfaces. Four theories given by Leonardo da Vinci, Amonton, Coulomb and Tomlison for dry lubrication are explained in following paragraph. As per Leonardo, “Friction made by same weight will be of equal resistance at the beginning of movement, although contact may be of different breadths or length”. “Friction produces the double the amount of effort if weight be doubled”. In other words, F α W.
The friction force is independent of the nominal area (F ≠ A) of contact between two solid surfaces. The friction force is directly proportional F α N to the normal component of the load. He considered three cases(Fig. 1) and showed that friction force will vary as per the angle of application of load. As per Amontons μ = 0.3 for most of materials. • Clearly distinguished between static & kinetic frictions. Friction due to interlocking of rough surfaces. • Contact at discrete points μstatic ≥ μkinetic. As per coulomb friction force is independent of sliding speed. But this law applies only approximately to dry surfaces for a reasonable low range of sliding speeds, which depends on heat dissipation capabilities of tribo-pairs. As per Tomlison due to molecular attraction between metal, cold weld junctions are formed. Generally load on bearing surface is carried on just a few points. These are subjected to heavy unit pressure, and so probably weld together. Adhesion force developed at real area of contact. There are two main friction sources: Adhesion and Deformation. Force needed to plough asperities of harder surface through softer. In lubricated tribo-pair case, friction due to adhesion will be negligible, while for smoother surfaces under light load conditions deformation component of friction will be negligible. Fig. 2 demonstrates the adhesion (cold weld) between two surfaces. Some force, Fa, is required to tear the cold junction. Fig. 3 demonstrates the deformation process. It shows a conical asperity approaching to a softer surface. To move upper surface relative to lower surface some force is required. 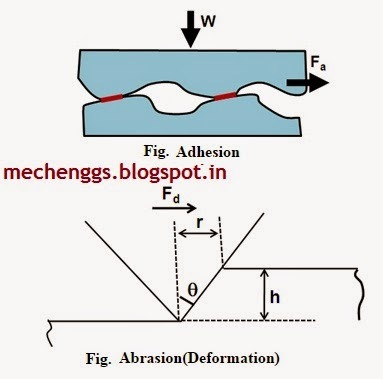 • Two friction sources : Deformation and Adhesion. • Resulting friction force (F) is sum of two contributing (Fa & Fd) terms. • Lubricated tribo-pair case — negligible adhesion. • Smoother surfaces under light load conditions – Negligible deformation. This theory is based on the fact that all surfaces are made of atoms. All atoms attract order one another by attractive force. For examples, if we press steel piece over indium piece (as shown in Fig. 4) they will bind across the region of contact. This process is sometimes called “cold welding,” since the surfaces stick together strongly without the application of heat. It requires some force to separate the two surfaces. If we now apply a sideways force to one of surfaces the junctions formed at the regions of real contact will have to be sheared if sliding is to take place. The force to do this is the frictional force. Bowden and Tabor developed theory of adhesive friction. As per this theory on application of W, initial contact at some of higher asperity tips occurs. Due to high stress those asperities suffer plastic deformation, which permits strong adhesive bonds among asperities. Such cold formed junctions are responsible for the adhesive friction. The real area of contact, A can be estimated by applied load W and hardness of the soft material, H. If s is shear stress of softer material, then force Fa required to break these bonds can be estimated by Equation Fa = As. The coefficient of friction due to adhesive friction is given by ratio of friction force to applied load W. Fig. 5 shows the formulation and breakage of cold junctions. • Two surfaces are pressed together under load W.
• Material deforms until area of contact (A) is sufficient to support load W, A = W/H. • To move the surface sideway, it must overcome shear strength of junctions with force Fa. • μ = Fa ⁄ W = s ⁄ H.
In other words shear strength(s) and hardness(H) of soft material decides the value of μ. This means whatever properties of the other harder pairing material, μ would not change. Fig.5 Summary of adhesion and ploughing. This theory is based on the fact that contact between tribo-pairs only occurs at discrete points, where the asperities on one surface touch the other. The slope of asperities governs the friction force. Sharp edges cause more friction compared to rounded edges. Expression for coefficient of friction can be derived based on the ploughing effect. Ploughing occurs when two bodies in contact have different hardness. The asperities on the harder surface may penetrate into the softer surface and produce grooves on it, if there is relative motion. • In first expression it is shown that friction depends on the lowest shear strength of the contact tribo-pair. Reducing shear strength and increasing the hardness reduces the coefficient of friction. • Second expression shows the dependence of coefficient of friction on the angle of conical asperity. • Third expression indicates lesser sensitivity of coefficient of friction compared to that of conical asperity. None of these expression provides reliable estimation of coefficient of friction which we observe during laboratory tests. Bowden and tabor improved that theory of adhesion and incorporated the limiting shear stress concept. Such a great review about your mentioned article. You website is great looking. Our business is modular kitchen cost per square feet region. How you feel about after gst for kind of business in india.